As one is accelerating out of a corner, it is far more difficult (and dangerous) to attempt to get your foot under the lever for an up shift. Being able to press down, quickly, creates a smoother and faster up shift. Additionally, most downshifting is done with the bike fairly upright, which means that you can get your foot positioned back on the peg prior to any extreme lean angles. While this is especially true on the track, in my opinion there are also advantages on the street. Most downshifting can be planned for in advance, and you can get your foot in position ahead of time and wait until the right time. Quicker up shifts are still advantageous as well, especially in hard acceleration such as merging onto a freeway. It also makes clutch-less up shifting easier and smoother. In general, GP shifting allows easier and faster shifting while keeping unsettling movements to times and places that are less prone to causing problems. Many riders who switch to GP shift also state that they find it to be more “intuitive” and natural once they are used to it. I believe they find this to be true due to the above reasons. Most modern sport bikes can easily be changed to GP shift with very little effort and OEM rearsets. 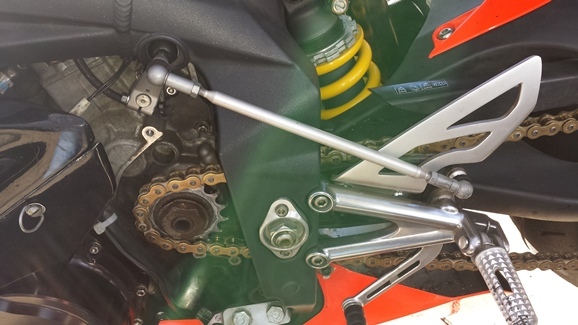 It can become a bit more complicated on bikes where the shift rod normally is routed through the frame (such as on my 2007 Triumph 675), but usually it can still be done with stock parts. Some bikes, such as my 2013 GSXR1000, may require minor moving of foot pegs or adjustments of the shift rod, while others are simply flipping the gear change lever. The biggest issue with switching to GP shift is if you tend to ride various bikes, or hop on other’s peoples’ bikes, you will have to keep track of which shift pattern that particular machine is set up with. For most people I know, it’s not usually too much of an issue, especially since most riders who make the switch are experienced enough to handle a miss-shift. If you’re thinking about putting in some serious track time or are just a fast street rider, GP shift may be something to consider. Most people who make the switch love it and don’t ever want to go back!